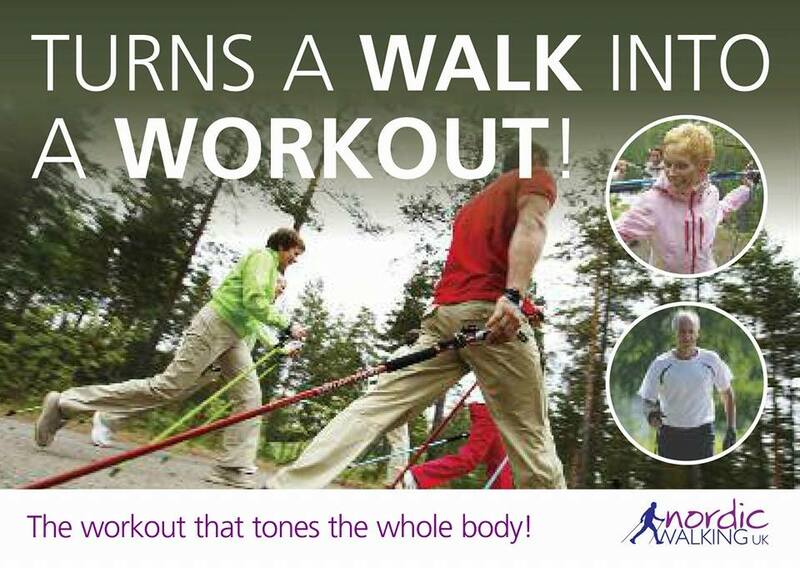 Learn to Nordic Walk…and turn every walk into a workout! Learn to Nordic Walk – the full body workout that provides fast results. Here I’d like to tell you a little bit more about the fastest growing sport in the UK and how Sara and John, members at Train Together, found their experience. 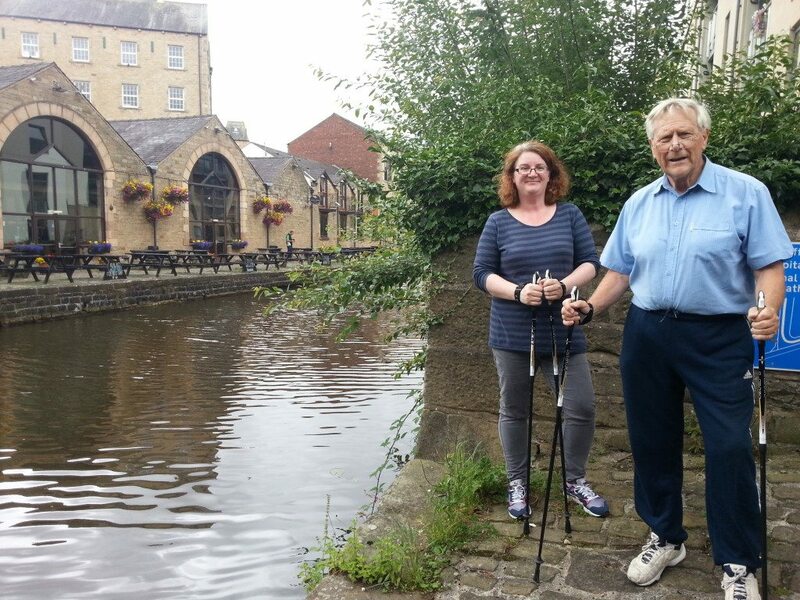 Nordic Walking has grown into a popular way for people of all ages and fitness levels to gain fitness, tone up, lose weight and improve their health. Unlike when trekking or rambling, Nordic Walking poles are planted behind you in order to propel you along. This engages the upper body and makes you feel lighter on your feet, which has four major advantages. You use 90% of your major muscles so your upper body gets toned as well as your legs and backside! You can get the most out of even a fairly short walk! 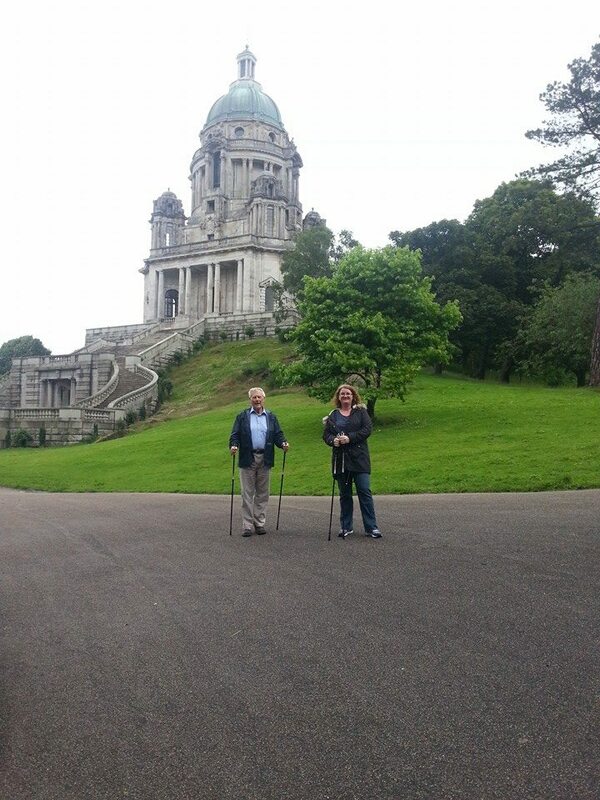 At the beginning of July John (74) and Sara (21..twice) started the first Learn To Nordic Walk course organised from Train Together. In week 1 we learnt how to hold, lift and plant the poles in order to give us balance and support whilst also propelling us forwards. From walking with two legs, we turned into quadrupeds and this allowed us to activate and work out the major muscle groups of our upper body whilst also making our walking flow much easier. Being an outdoor activity we were also able to take in the scenery of the Lancaster canal. In week 2 we had a quick refresher of what we had learnt in the first session and then we progressed to using the poles for some hill work. It is equally possible to walk on the flat grass or tarmac, as it is to walk up inclined gravel or bark laden tracks in the Lake District. The key is a good upright posture, and a fluid arm swing. So, here in Lancaster we headed out on the urban paths behind the Industrial Estate and up to Williamson Park. In week 3 we set off along the Lancaster canal in the direction of Aldcliffe. There was a bit of action as a Coastguard helicopter landed close by on the other side of the canal near the hospital. Within 15-20 minutes we had escaped the concrete jungle and were able to test our ability to work with the poles through the gears and get a bit of a sweat on. With good technique as well as desire and determination the poles can be used to get a really beneficial full body (and mind) workout. Out of town our senses were stimulated by the sun on our faces, the sound of birdsong in our ears, and even seeing some Alpaca roaming around a random field. 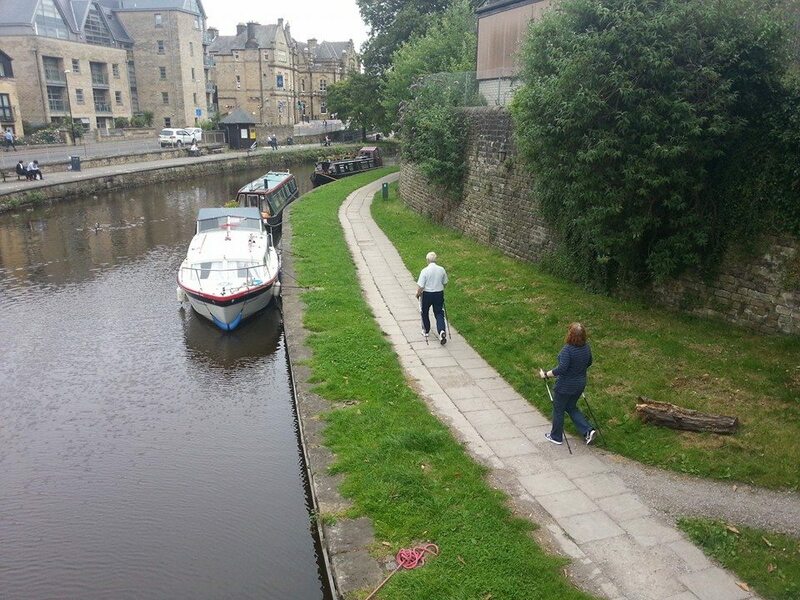 To complete the course in Week 4 we decided to explore the Lancaster canal in the other direction out of town. Within 5 minutes we came to a spot with a fantastic view over the city towards the Castle. From here we strode out almost as far as the golf club and the Aqueduct. 30 minutes out, 30 minutes back, this was definitely more than a normal walk on two feet. Nordic Walking is something I have always wanted to try. I do a lot of walking day to day and I wanted to get more out of my daily routine. So I jumped at the chance to try the taster session when I got the email from Train Together, I enjoyed it so much, I immediately signed up for the 4 week course. 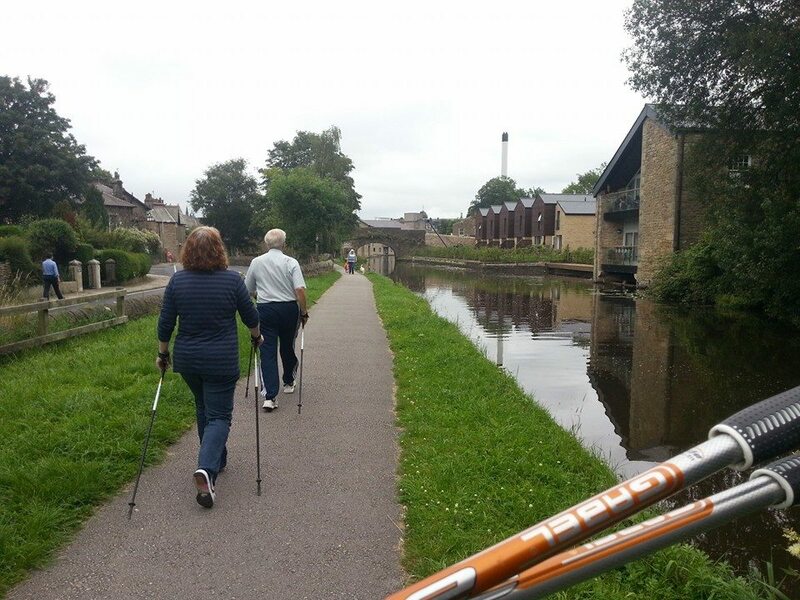 Matt is incredibly passionate about Nordic Walking and it shows in his teaching. No question is too daft and Matt is always encouraging you to check form and posture while walking so you know you are minimising risk of injury and keeping pressure off your joints. When we were first given the poles to walk with I couldn’t understand how this would aid weight loss or be classed as a workout. How wrong was I!! My heart rate monitor showed over 250 calories burned in less than 30 minutes and my arms and shoulders ached like I had been lifting weights! Walking day to day with children, you tend to look down a lot looking for hazards, but with Nordic you are encouraged to look up and look ahead, the poles really help with this and it’s amazing how much you miss when you are looking down. Over the last 4 weeks we have attempted all types of terrain and we have discovered parts of Lancaster that I didn’t know existed! Thanks to Matt’s patient tuition, I am walking taller and I have purchased my own set of poles and I’m planning lots of walks.